A college graduate is more than excited about that first full-time job. It means a large paycheck and more money in the bank account than was ever seen before. All the excitement of being independent makes this person forget a very important point about the college loans. There is a time of grace permitted, but after that regular payments are must be paid on a routine basis. 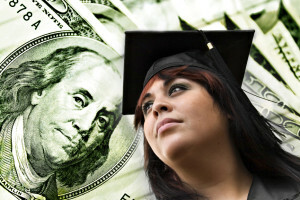 There are serious consequences if the recent college graduate forgets to start paying. There can be penalties involved which cause the loan debt amount to grow. The new employee gets caught off guard, finding that he or she has to suddenly start paying a sizable amount. It could cause a panic that may throw financial wellness into a spin. A young person is not a spendthrift and wants to be fiscally responsible. He or she has no doubt set up a budget and is trying to stick to it. What happens, though, is that bills not currently being paid are not part of the budget. It is very possible that the budget which has been created has very little flexibility. It means that should a sudden and unexpected increase occur; all the figures have to be readjusted. If the confusion becomes too great, then real trouble happens. If in responding to the loan requirement a person forgets to pay a credit card, there will be a penalty attached to that nonpayment and credit scores suffer. Those developments are going to hurt financial wellness. The employee has the best of intentions but may be caught in a serious budget dilemma. Employers who are sensitive to the needs of their workforce want to help. The decision-makers understand that a new employee can run into some difficulties. It is why they look to benefit programs which will provide needed support. Countrywide Pre-Paid Legal Services offers a financial wellness plan. It has features that will help the new arrival in the working world. Countrywide has a network of financial counselors across the country. They have worked with other people helping them create budgets and deal with college debt. The plan member can be a little bit embarrassed about forgetting the grace period would end. Still, he or she wants to be treated like an adult and will not appreciate a sermon. We respect that and we expect our financial counselors to provide assistance, not stern lectures. It is much more important to help and the counselors work closely with the financial wellness plan member. The existing budget is reviewed, and some recommendations are made for changes. The counselor is aware of the need for flexibility, and so the budget is not structured to tightly. There’s enough room for unexpected emergencies in the dollars. The government does not want to be unreasonable and will allow for some leeway. Our financial counselors are aware of what can be done to ease things, and will alert the plan member to them. By the end of a session or two, the new employee feels less stressed out. The problem has been addressed in a professional manner and a solution has been derived. It permits this person to concentrate more on work projects than trying to find money to pay the loan. Countrywide wants to provide service that all employees can use. Our financial wellness plan has a number of options which decision-maker may look at. The intent is that the client decides what is going to be part of the plan. We will see to it that the choices are part of the final document, and we will also make sure the administration is as simple as possible. All of this has our commitment to client satisfaction as part of the package.